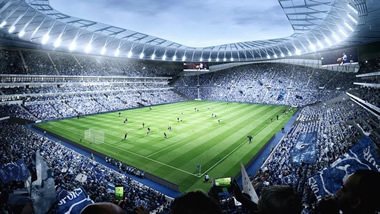 With one foot in the grave and the other in the past, I was grateful to get a glimpse of tomorrow�s world following the release of plans for Tottenham�s stunning new White Hart Lane ground. Mind you, prepare for our hallowed home to be called something like McDonald�s or The Coca-Cola Stadium. 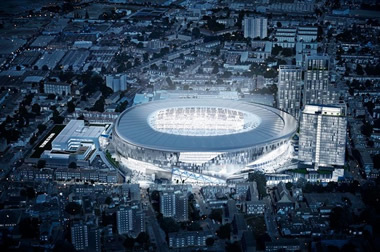 Joe Lewis and Daniel Levy, main shareholders of Spurs owners ENIC under the umbrella of the mega-rich Tavistock Group, are looking for a fortune for the ground naming rights. The fact that they have signed a ten-year deal with the NFL for American Football matches on �the other pitch� in the futuristic stadium will have huge appeal to leading international companies based in the USA. Lewis and Levy are far too shrewd to take on the huge commitment using their own money, and even as I write will be negotiating deals with prospective partners. The fabulously wealthy Joe Lewis, whose billion-pounds art collection alone is worth more than ten Premier League clubs put together, is galloping towards his eighties and will, I am certain, be happy to let somebody else take the main financial strain of the ambitious project. Those na�ve people on line talking from the heart about having the ground called after Bill Nicholson or retaining White Hart Lane as the name are showing they have no grasp of the modern business world. The likes of Lewis and Levy talk from the pocket and put the needs of their shareholders before those of the supporters. In this age of major international financiers, Spurs are lucky to have two of the best in their corner. I wonder what Edward Beaven, Robert Buckle, Frederick Dexter, Stuart Leaman, Edward Wall, John and Thomas Anderson, Lindsay and Hamilton Casey, John and Philip Thompson would have thought of the plans for the new stadium? They were the original Hotspurs, who held the famous 1882 meeting under the yellow glare of a gas-lit lamppost in Tottenham High Road, when they decided to form a football club. All true Tottenham supporters should know the story of how the club was shaped by cricketing pupils from the local St John�s Presbyterian and Tottenham Grammar Schools. These well-educated youths, most of them from middle-class backgrounds, wanted something to do in the winter months, and there under the lamplight they decided unanimously to start a football team to be called Hotspur Football Club. Their first match on September 30 1882 was a defeat by two goals on Tottenham Marshes against a team called the Radicals, this at a time when football, particularly in the south, was almost exclusively amateur and six years ahead of the launch of the Football League. The London-based Football Association was the governing body and jumped on anything that hinted of commercialism or anybody earning from playing the game. What they would make of today�s �100,000-a-week footballers defies imagination. There was no Joe Lewis or Daniel Levy to foot the bill. That was all yesterday�s world. Now fasten your safety belts ready to go into football�s New Age. But never ever forget the club�s roots, otherwise you will lose the Spurs spirit. Last summer you may recall I kept a count of the players that the �In the Knows� said were heading for Tottenham. The total reached 54, with just two of them signing for Spurs. They are at it again this close season, and my advice is that you should never take notice of the rumours until the players are actually photographed wearing the Lilywhite shirt. One deal definitely going through is that of Belgian defender Toby Alderweireld from Atletico Madrid, via Southampton. The Saints insist they had first call on Toby, who was a huge influence on the Southampton defence when on loan last season. It could be an argument that ends up with legal fisticuffs. It will mean an all-Belgian heart to the Spurs defence, Alderweireld lining up alongside his countryman Jan Vertonghen. With an overload of central defenders, I wonder if Pochettino will be tempted to try a sweeper system. Mind you, Hugo Lloris would say they already do! Latest news on Jimmy Greaves is that he continues to make slight improvement, but he still cannot walk unaided. He is desperate to go home to his wife Irene, but has been told he needs specialist treatment in the rehabilitation centre for at least another seven weeks. Meantime, his good pal Steve Perryman is getting together with several old Spurs team-mates to organise a special Greavsie night. Watch this space. Let me stress once again that Jimmy has not asked for any money to be raised. All his concentration is on fighting back after being left without movement on his right hand side. The motivation for setting up a fund came from Spurs fans, who approached Terry Baker, and the support-Greavsie fund was born. I promise that any donation, no matter how small, will be hugely appreciated by the greatest England and Tottenham goal scorer of my lifetime. Each week while waiting for the kick off to the second Spurs Odyssey Quiz League, I will be challenging you here with a question to test your knowledge of Tottenham. I caught ony a handful of you out with last week�s teaser: Who started his career with Arsenal, had a loan spell at West Ham and missed from the penalty spot for Spurs in a Wembley cup final, and from which club did he join Tottenham in 2008? Yes, it was David Bentley, who arrived at Tottenham from Blackburn Rovers. He never quite reached the heights he was hoping for, but we will always remember that special goal against the Gooners in the 4-4 thriller at the Emirates. And, of course, there was that bucket of water over manager Harry Redknapp. Happy days. First name drawn from the correct answers is Frank Hughes, of Aldworth, Berkshire. I will email a screen version of one of my Tottenham-themed books to Frank, who has been a Spurs supporter since the Glory-Glory Double year of 1961. This week�s teaser: Who started his career as a trainee with Tottenham in 1998, won 42 international caps and returned to Spurs from which club in 2009? Email your answers, please, to gillerteaser@normangillerbooks.com. Don�t forget to add your name, the district where you live and how long you�ve supported Spurs. Please consider purchasing any of my books direct from me at www.normangillerbooks.com, including No 99 that I have written in tribute to Muhammad Ali for whom I worked as a publicist on his European fights. All profits from my Tottenham-themed books go to the Tottenham Tribute Trust to help any of our old heroes who have hit difficult times.